He quickly grew a strong reputation as a confident and successful shooter from all spots on the court for Mount Vernon. The 6-foot-2 shooting guard has averaged 20 points, 5 assists and 3 rebounds per game in his first three years at Mount Vernon. Last year, he hit a career high 31 points, 19 of which were scored in the first quarter in a home game against White Plains. He was also part of the 2017 state championship team. Douglas-Stanley chose George Mason because he felt it was the best situation for him, both on and off the court. It was a situation where he felt he can fill a need for the team as a scorer. Mount Vernon Coach Bob Cimmino hosted the ceremony at the high school Thursday where more than 50 people attended and several coaches, players and district personnel spoke. Rondine Stanley, Jason’s mother, thanked everyone for their support of Jason and said her family has been very blessed. “I am your No. 1 fan. I love you,” she said told him. Superintendent Dr. Kenneth R. Hamilton said he was proud of the opportunities the students enjoy and experience because of the dedication and hard work of the staff and teachers who make those opportunities happen. 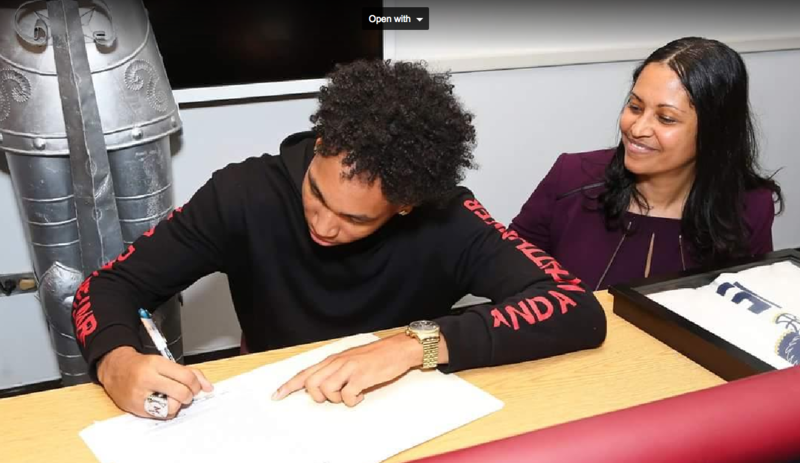 Jason Douglas-Stanley signs a National Letter of Intent with his mother, Rondine Stanley, by his side.